My first time making nail art designs with water decals went only so-so. The result is beautiful, way better than I could have ever done by hand. What really bugged me was the fact that when I applied pressure to the back of the paper, it accidentally slipped off my finger as soon as the decal let go. That made some spots in the pattern. Could just be the low quality of the decals, though. And you might like the effect if you like grungy-type designs (like the cracking nail polishes, which I will never ever ever wear because I strongly dislike them). Also, I've noticed that the decal is starting to let go after a few days. I've had this design for three days now and some parts are just coming off way too easily, taking the top coat with them but still leaving the white polish underneath the decal intact. This makes any damage hard to see because there's no parts of the natural nail exposed, but I guess water decal manicures are not the right choice if you're more of a long lasting nail art type. Me, I like my nail art for a few days and then I can't wait to make something new. 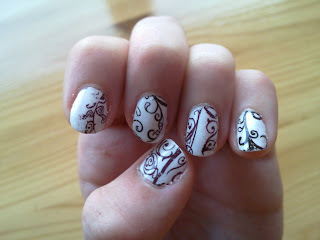 So, water decals: very pretty, but not very long lasting.